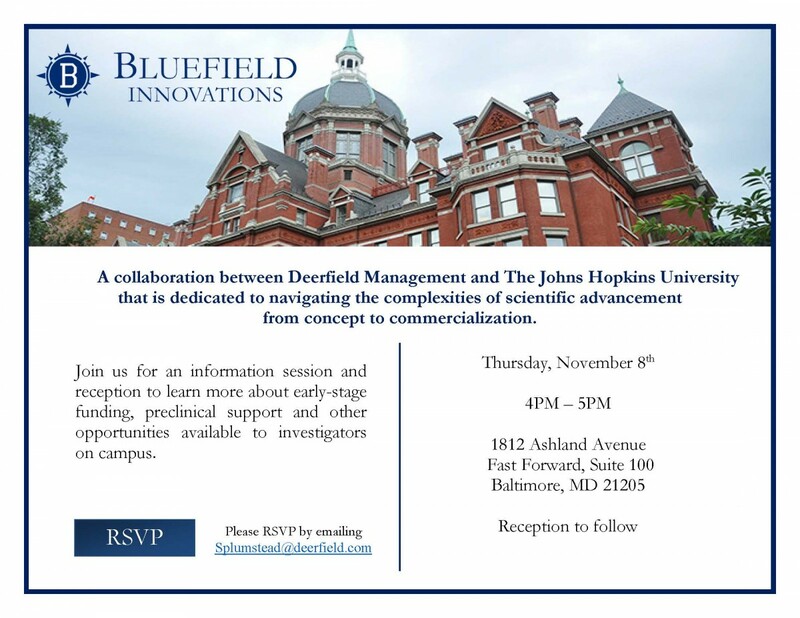 In November 2017, Deerfield Management and Johns Hopkins Technology Ventures announced the creation of Bluefield Innovations, a collaboration designed to catalyze the development of early stage therapeutics. Funded by Deerfield, an investment management firm committed to advancing healthcare, Bluefield Innovations is providing up to $65 million in initial funding over five years to support the commercialization of early stage therapeutic research at Johns Hopkins, with additional funding available to advance research showing strong commercial potential. A joint steering committee is helping to identify the research that Bluefield will support through the preclinical development process—including basic research, proof of concept, target selection and investigational new drug (IND) enabling studies designed to qualify a candidate to enter into human clinical trials. Combining the respective strengths of each organization—Johns Hopkins’ scientific discovery expertise and Deerfield’s drug development, operational and financial support—enables Bluefield to reduce the financial and developmental risk associated with early stage novel projects.